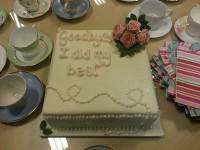 Yesterday was Mrs O’Brien’s last day at Kings Furlong Junior School; she retired after an amazing 27 years. Thank you for passing on your best wishes to her. I’m sure we’ll see Mrs O’Brien around our school- reading with pupils, helping on trips or at special events like Sports Day. In the meantime, we wish her a very happy retirement!